Cardel Homes is proud to support the Calgary Board Education and the Little Libraries Project, in which students design and build small pop-up libraries. These little libraries are installed in public community spaces, offering books that everyone can take (for free) and a chance to share books back in kind. Through registering with Little Free Libraries, the libraries become part of a network of little free libraries across Canada and the United States. 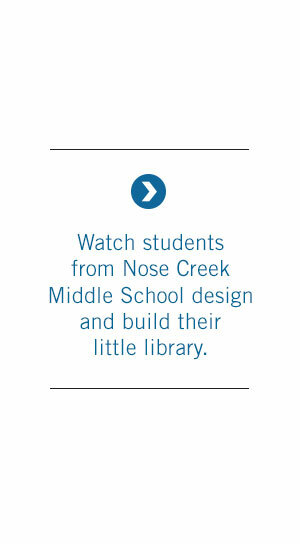 Combining design, construction, learning, teamwork and community service, the Little Libraries Project aligns with educational Career & Technology Foundations, which encourage students to explore interests and skills while making personal connections to career opportunities. During the 2014/2015 school year, Cardel funded the program for four schools: Nose Creek Middle School (Grades 4-9), Twelve Mile Coulee (Grades 4-9), A. E. Cross School (Grades 7-9) and Robert Warren School (Grades 5-9). While most schools are offering the project as a construction-class component, others, like 12 Mile Coulee, approach it as an extra-curricular option (the libraries from this school will be distributed through connections with Calgary Reads 3). On June 18, 2015, Cardel had the pleasure of visiting Robert Warren School to view the final project. We treated the students to a Pizza Party and provided each student with an Indigo gift card to purchase their own books. Cardel is honoured to support this fun, educational program that helps create foundations for bright futures in construction and beyond.